One set of dolls with the Mary Hoyer face that I find really interesting are the Hedwig de Angeli dolls. Most of you are familiar with the modern American Girl dolls and the books that accompany them, but you may not know that the Hedwig-de Angeli dolls were the very first "American Girl" dolls in our country. 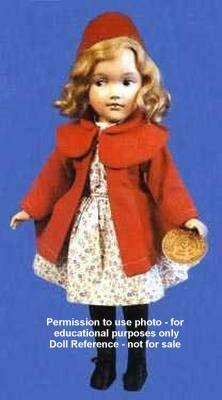 The Hedwig dolls were created to depict the characters in the children's books written by author, illustrator, singer, social reformer Marguerite de Angeli. . . . continued below. The de Angeli stories taught lessons about history and tolerance for other people from different backgrounds. All of the books depicted by the Hedwig dolls carry the message that we are really all alike inside and we all deserve the same respect and recognition. De Angeli's books were ahead of their time in depicting the everyday lives of struggling minorities such as; Quakers, Mennonites, Pennsylvania Dutch (Amish), French Canadian, Swedish, the handicapped, and black Americans. de Angeli is considered to be the first author to address the issue of racial prejudice in a children's book (Bright April, 1946). 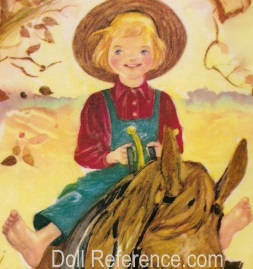 One of her books (The Door in the Wall, a story about a crippled boy), has been in continuous publication since 1949. De Angeli wrote in her autobiography that she wanted to show children "It's not who you are that counts, it's what you do, with what you have that matters! A wonderful message, indeed! 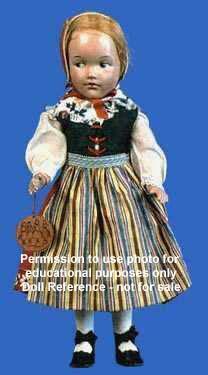 I think it is important that collectors see these dolls so they become more widely known. Otherwise, all-original Hedwig dolls run the risk of being stripped of their ethnic clothing, redressed and sold as either Mary Hoyer or Arranbee (R&B) Debu'teen dolls. When that happens, a little piece of doll history is lost. 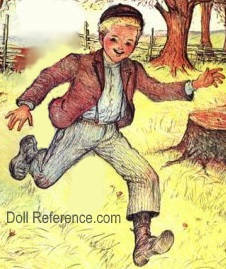 The Hedwig dolls are indexed and referenced in doll books under the names: Hedwig, Hedwig-deAngeli, de Angeli or DeAngeli and sometimes the incorrect spelling DiAngeli is used. (Photo of Marguerite in 1909) Marguerite Lofft de Angeli was born on March 14, 1889, in Lapeer, Michigan, (died in 1987) and moved with her family to Pennsylvania when she was 13. Both states claim her as a "Daughter." de Angeli showed great artistic and musical talent at a very early age. She writes in her autobiography "Butter at the Old Price" of an experience as a two year-old when she was left alone in a room with a box of pastels: "What excitement to feel the soft touch on the canvas, to see the cool bright mark it made. Pink, fiery red, orange, violet, cool blue, and green. What wonder! I could not stop until I had tried them all. Even the gentle but serious talk my father gave me with my little hands in his could not erase the joy of that first experiment with color." By 1910, de Angeli had begun a very promising professional career as a concert contralto when she met John Daily "Dai" de Angeli in Canada. They fell deeply in love, married and settled in New Jersey to raise a family. Although Marguerite abandoned her professional career in favor of being a wife and mother, she expressed few regrets, she and John raised a family of six children. Marguerite de Angeli had a restless, artistic soul and was driven to follow her literary, artistic, and musical muses …but her family always came first. She wrote about the dilemma of being a mother and a writer/illustrator: "Sometimes I see myself standing beside the dining room table, eager to begin or continue a drawing or a page of manuscript and thinking to myself, if only I didn't have to iron Nina's dress or mend Maury's trousers or sew that button, I could, then sternly reminding myself of a happy day in my childhood, I would think, perhaps this will be one of those days my children will remember. I'd better make it a good one!" Despite the need to balance art, music, and writing with her family's needs, Marguerite de Angeli managed to produce a remarkable literary legacy. Her body of work spanned more than 50 years and included illustrations for several well-known magazines, 30 children's books, a poetry anthology, an autobiography, and illustrations for more than a dozen books by other authors. de Angeli received numerous literary awards before her death at age 98 in 1987, including the Newberry Medal, the Newberry Honor Award (twice), the Lewis Carroll Shelf Award, the Caldecott Honor Medal (twice), the New York Herald Tribune's Book Festival Award (twice), and the Regina Medal. 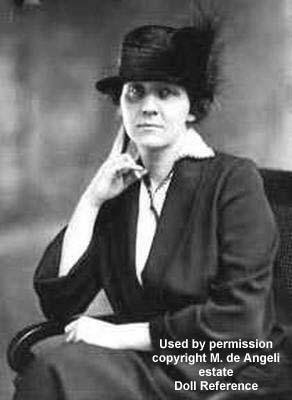 She was also named a "Distinguished Daughter of Pennsylvania" and was inducted into the Michigan Women's Hall of Fame. Doubleday became de Angeli's publisher when she first began writing and illustrating her own books. The books were well received by both children and adults. 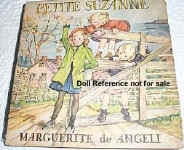 At one point an adult collector, Marian Poe, mused that it would be wonderful if the children in Marguerite's books could be depicted in doll form, and de Angeli and her friend, Hedwig Ryglewicz, agreed. Doubleday was pleased with the concept, too, and so the idea took flight. 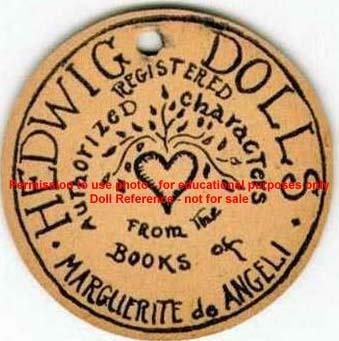 Marguerite's friend Hedwig Ryglewicz, who was a very accomplished seamstress, volunteered to costume the dolls in outfits depicted in the books, so it was decided that the dolls would be called "Hedwig Dolls." 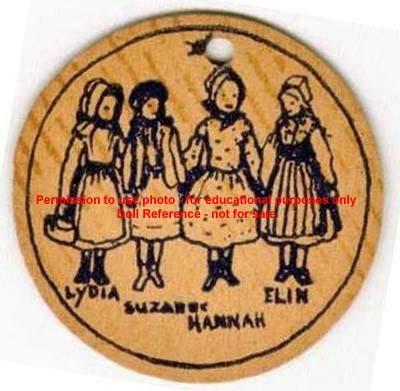 It was also decided that each doll would carry a 2" round, black and yellow cardboard tag tied to its wrist (shown above front and back). 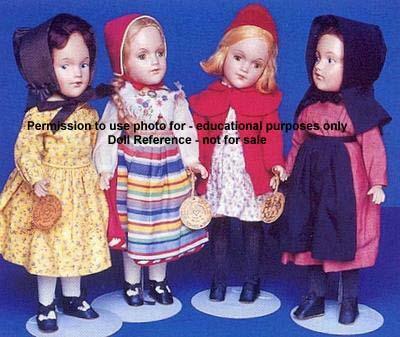 The early composition dolls with the Mary Hoyer face mold are the most difficult to find and also the most expensive to buy. The Hedwig dolls were produced during the 1940s and 1950s as exhibit supplements used by book salesmen and they could be purchased only through Doubleday. After a trip to New York's doll manufacturing district to find an appropriate doll, Hedwig and de Angeli ordered the first 100 dolls from the Ideal Doll Company. They were made of composition, had five-piece strung bodies, painted or sleep eyes, mohair wigs, and were 14" tall. 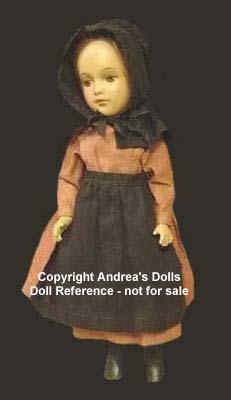 They were the very same dolls used by both the Mary Hoyer Doll Company and the Arranbee Doll company. The Hedwig dolls carried no identifying head or body markings at all, ever. This is one reason they are so hard to identify today, particularly if their original ethnic clothing has been lost and they are redressed. When the doll project began, Hedwig quit her job and devoted more than two years to costuming the first 100 dolls. Pouring over Marguerite's children's books, Hedwig carefully chose which costumes to copy, and then she and de Angeli made a whirlwind trip to New York's garment district to find exactly the right fabrics and trims to use. The resulting costumes were little works of art, meticulous in every tiny detail. Hedwig also custom-designed the mohair wigs for the dolls she planned to dress first, and she paid particular attention to making authentic hairstyles. For example, Quaker Hannah's hair is brushed away from her face and pinned at the back of her head, just as her faith dictated, and Swedish Elin's hair is neatly braided. 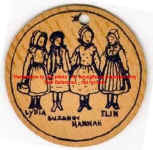 French-Canadian Suzanne's blonde hair falls loose in a mohair bob, and Amish Lydia's auburn braids are twisted into a bun at the nape of her neck. Originally, Hedwig designed the four girl characters, (shown at top) based on Marguerite de Angeli's books, but more characters were added as books were published, including three more girls and two boys. Both the dolls and their costumes varied over the years, but the costumes were always meticulously sewn by Hedwig, and they always depicted the exact costumes worn by the characters in the books. The costuming was accurate right down to the number of buttons and the size and type of trim decorating the skirts. Hedwig costumed and wigged the de Angeli character dolls over a period of about 20 years and there are many differences between the early dolls from the 1940s and those purchased and costumed later. The April doll (from the book; Bright April 1946), for example, was a cheap hard plastic doll produced in the 1950s, but she is still sought out and valued by collectors, because she is a Hedwig doll. Anelia & Cecelia dolls, 14"
In all, Hedwig created nine character dolls based on Marguerite de Angeli's books - Anelia doll (Polish, blonde hair), Cecelia doll (Polish, blonde hair), April doll (African American, black doll), Elin doll (Swedish, braided blond hair), Hannah doll (Quaker, brunette hair in a ponytail), Lydia doll (Amish, auburn braided hair twisted into a bun), Suzanne doll (French-Canadian, long blonde curly mohair wig), Tadd (boy doll) and Yonie Wondernose (blonde boy doll), all dolls are 14" tall. 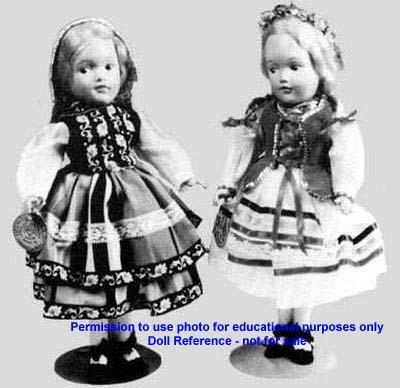 It is not known exactly how many dolls were produced altogether, but it is believed that fewer than 100 complete and original dolls are still in existence. Most of the known dolls are currently held by de Angeli's heirs and friends or by private collectors and they are seldom if ever sold on the open market. When found, the Hedwig dolls are highly prized by those collectors who are aware they exist and now you know too.